Deck the fridge with a magnetic Christmas tree! 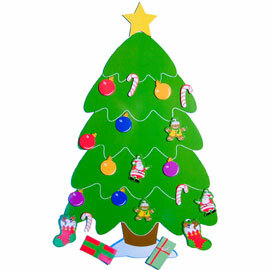 Have fun ″decorating,″ then ″redecorating″ this cheerful, magnetic Christmas tree each time you walk by the fridge! The kitchen will look extra festive with this 22-piece set holding up Christmas cards, gift lists and holiday photos. Take it to work and put it on a filing cabinet – or any indoor metal surface. The tree itself is a generous 11" tall and 7" wide, and you don't have to water it!